WaveForms is the software interface that controls the Analog Discovery 2, the Digital Discovery, and the Electronics Explorer Board. 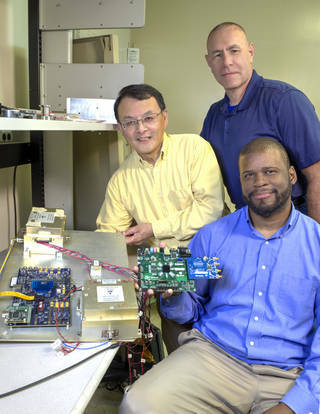 Soon it will also control the Analog Discovery Studio, providing access to all of the bench-top tools. 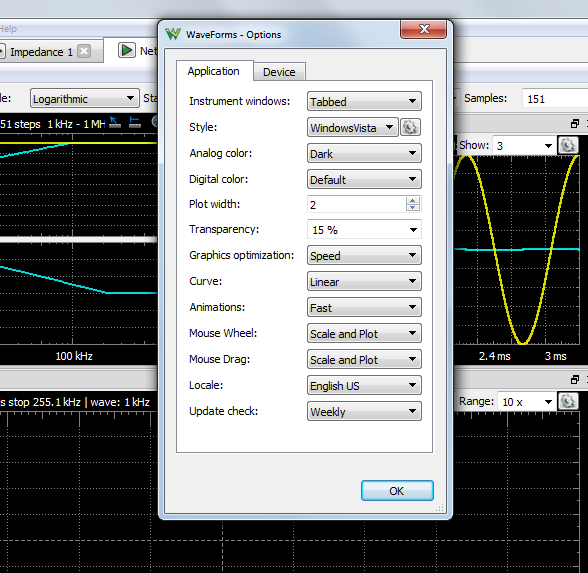 We posted an updated version of WaveForms, version 3.10.9, which is available for download on the Digilent Wiki. 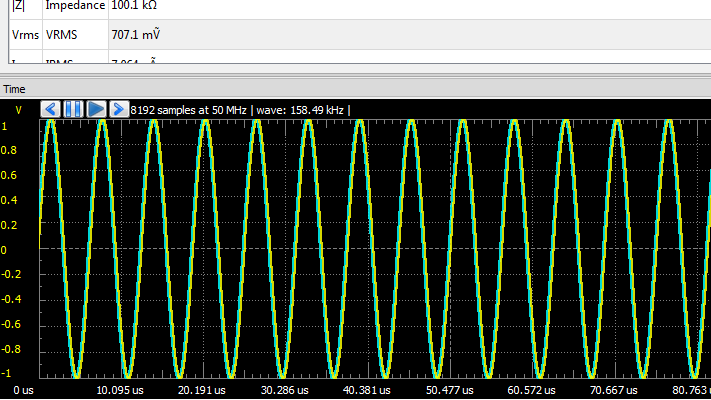 This new version of WaveForms includes new programming language compatibility with WaveForms SDK, improvements to the impedance analyzer, bug fixes and more! 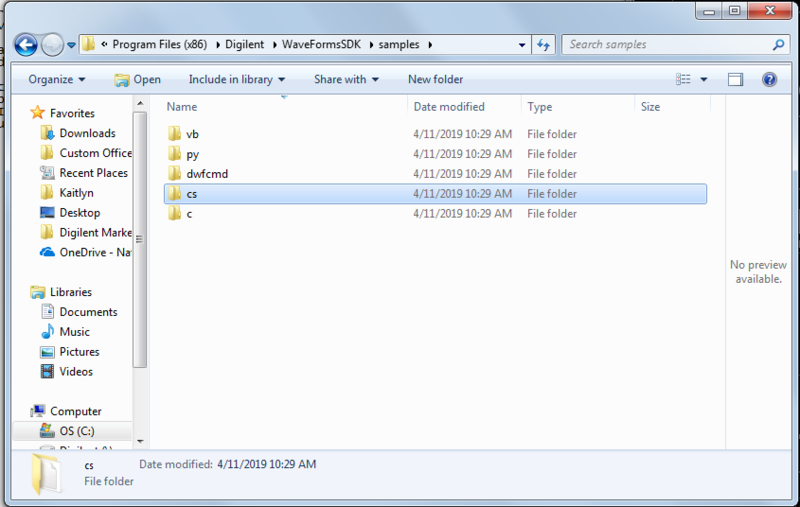 You can view the entire change log on the WaveForms Download page, but here is a summary of the biggest changes. 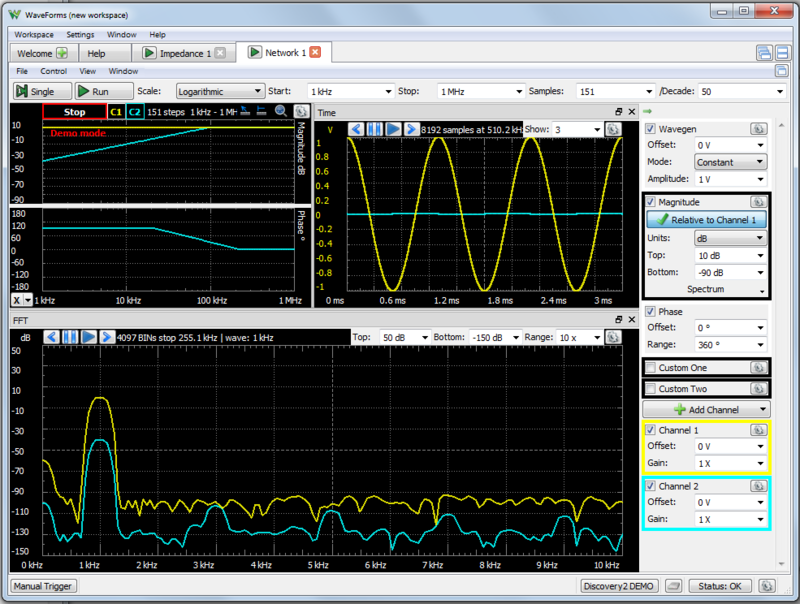 The digital channels can now be accessed from the oscilloscope and displayed on the same graph. 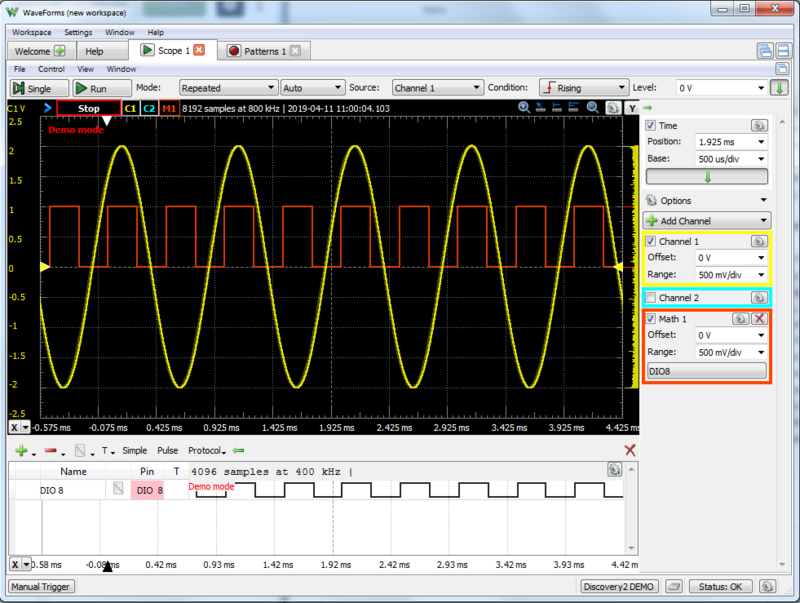 To use, add a digital channel, then add a math channel and select the digital channel and it will appear in the oscilloscope plot. 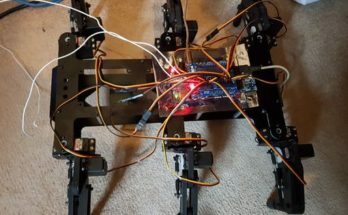 The power supplies can now be changed via a slider and have a minimum and maximum set. Check the tracking check box and the two supplies will always have the same value. 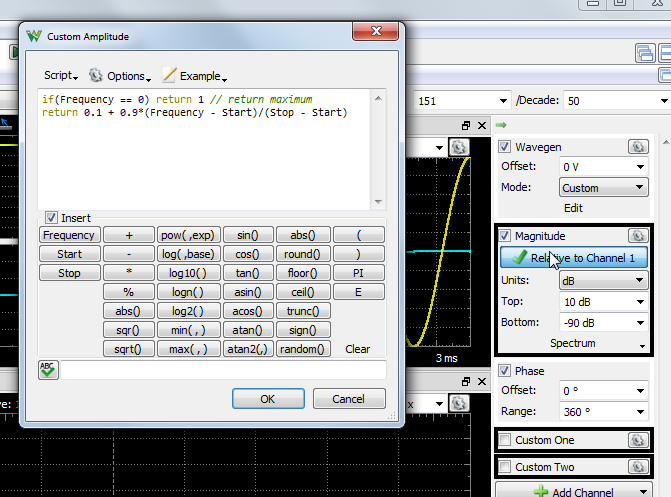 Measurements are now available in the logic analyzer. 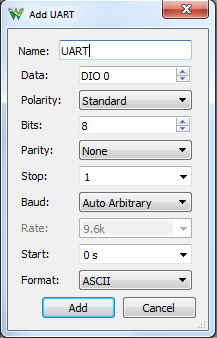 Decoded UART data in the logic analyzer can be displayed in a nine different formats including ASCII and decimal. 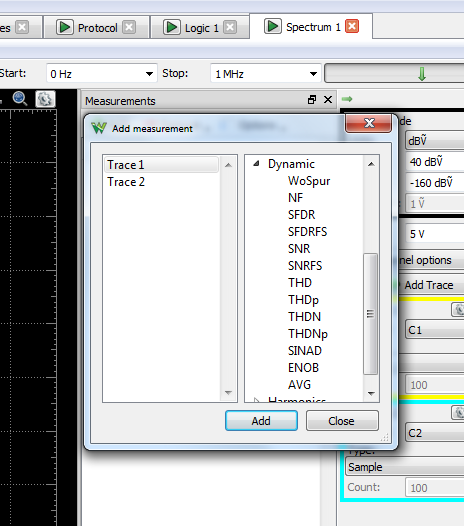 More measurements and units are now available in the spectrum analyzer. 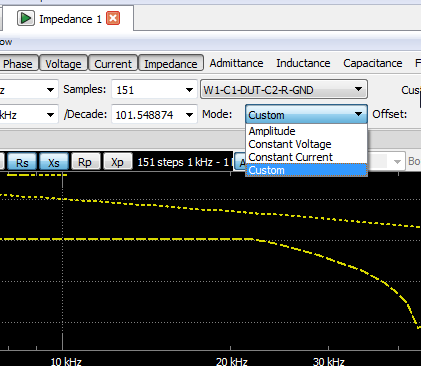 New modes are now available in the impedance analyzer including constant current, voltage, and a custom script option for amplitude and resistance control. 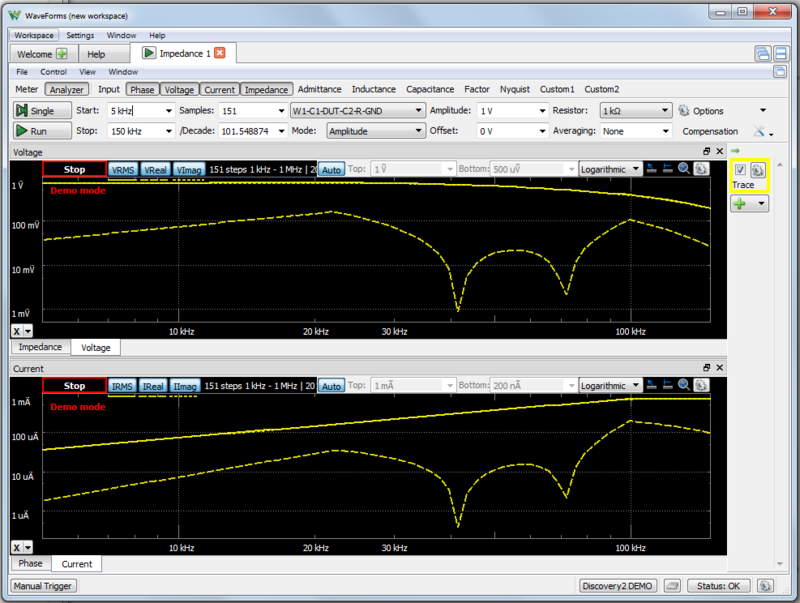 New plots are also available in the impedance analyzer such as voltage, current and custom plots. 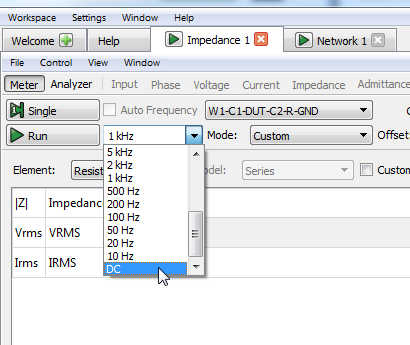 The impedance analyzer meter window includes a list of measurements that can now be edited. 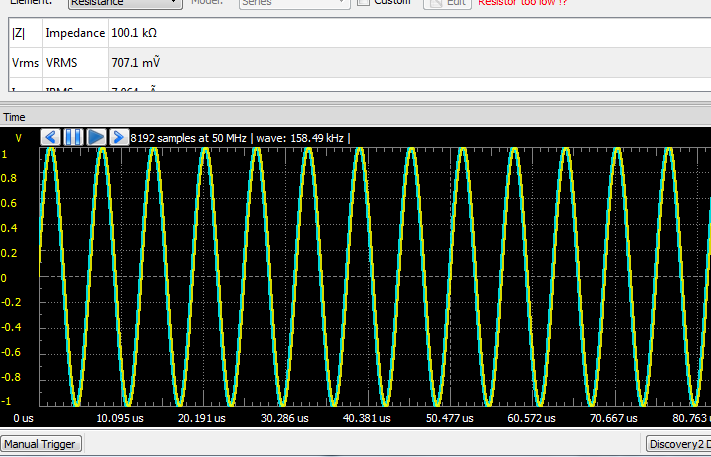 The meter also now has a “resistance” mode in addition to inductance and capacitance modes. 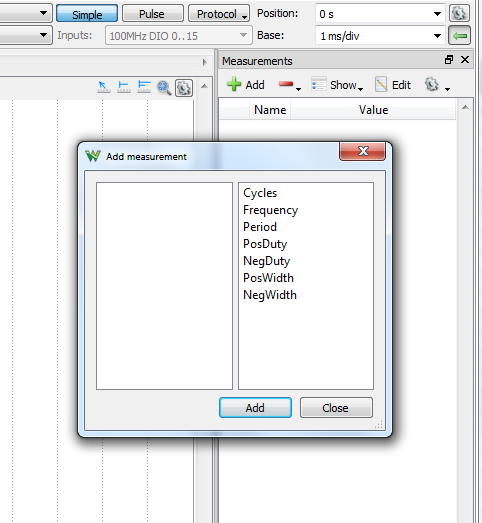 The measurement frequency now also includes a DC option in addition to the following available frequencies. The time view now includes a step mode. 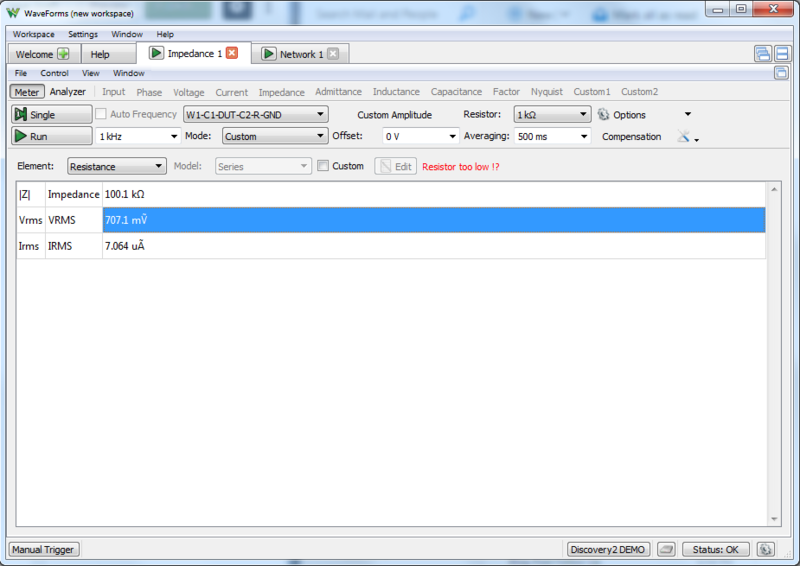 The time and FFT views in the network analyzer also have the added step mode functionality. 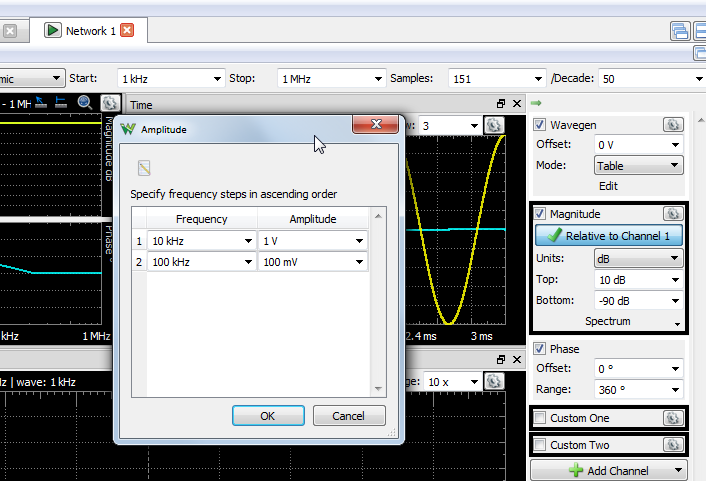 The input amplitude can now be controlled by the waveform generator or created from a custom script or table of step values. 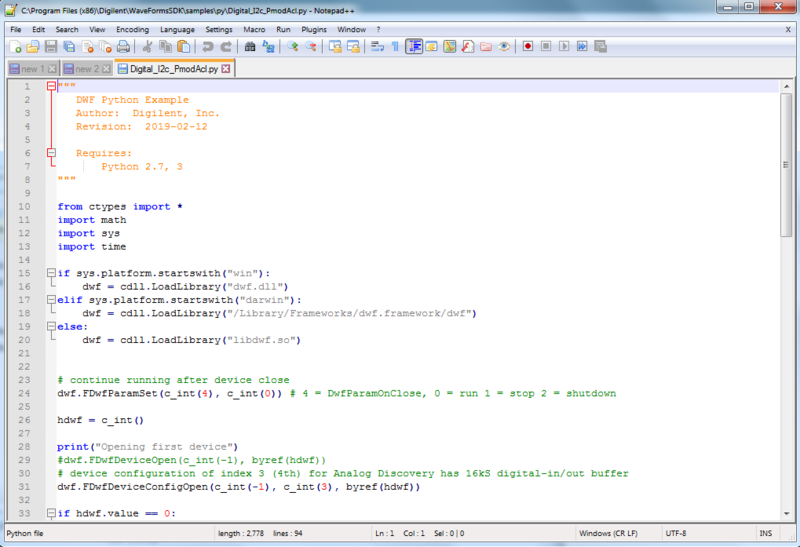 Visual Basic and C# are now added to the available programming languages including C, and Python. 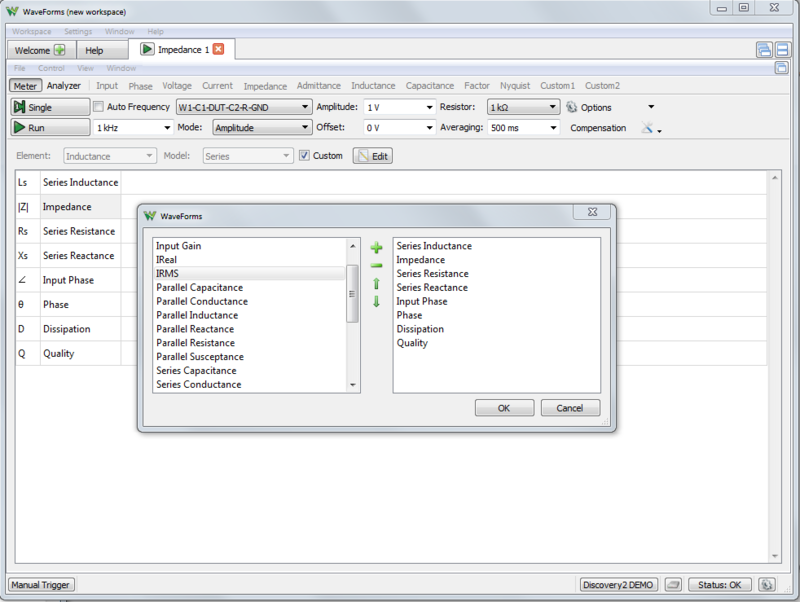 The options menu for the application now allows the mouse wheel, and drag operations on the plot and scale to be disabled. 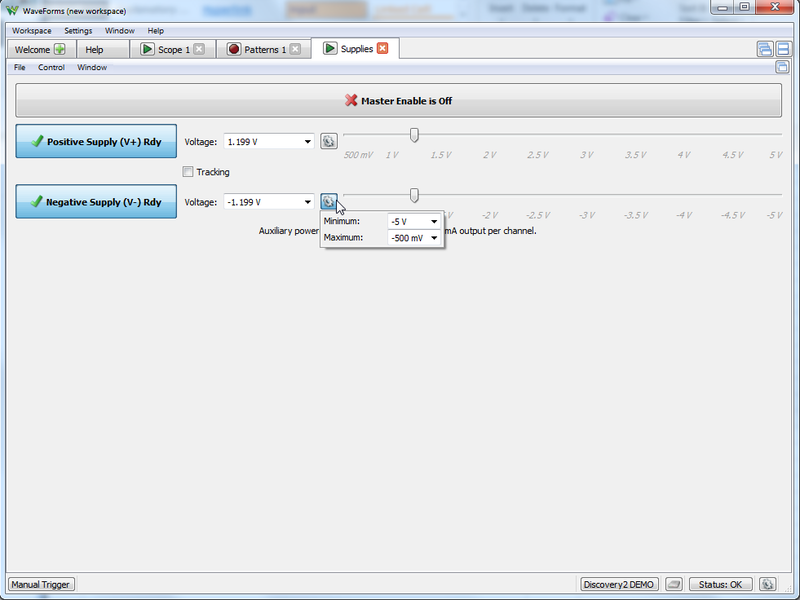 Test out all these new features and more by downloading the new version of WaveForms from the Wiki! Previous Article The OpenLogger Is Here! 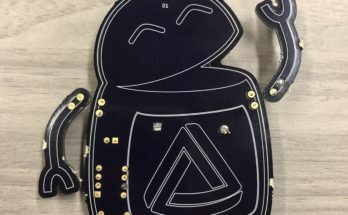 Next Article The ZedBoard In Space?